What are the manifestations in Eye in cases of Thyrotoxicosis due to Graves Disease? The condition is otherwise called Graves opthalmopathy. It is an autoimmune inflammatory disorder affecting the orbit around the eye, characterized by upper eyelid retraction, lid lag, swelling (edema), redness (erythema), conjunctivitis, and bulging eyes (proptosis). What are various signs seen in Graves opthalmopathy? What is the cause of development of Graves Opthalmopathy? The autoantibodies target the fibroblasts in the eye muscles, and those fibroblasts can also differentiate into fat cells (adipocytes). Fat cells and muscles expand and become inflamed causing buldging of eyes. Veins become compressed, and are unable to drain fluid, causing edema. What percentage of Graves disease patients are affected? 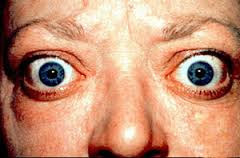 Graves opthalmopathy affects between 25-50% of patients with Graves' disease. How is Graves opthalmopathy treated?